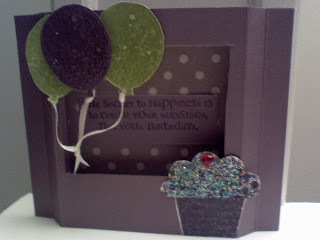 Create Embellish Adore: Birthday in the building! So today, July 30 is my boss's birthday. By now, if you work here and didn't know, you would know. She's the person that celebrates all month long... and honestly has to wait all month long until her day actually gets here. When it does, its an all day celebration... honestly... which is fun.. and annoying! .. I can say this because I doubt she follows this, and second, she is in Singapore and on her way to bed for the night.... but hey, when she left last week, she told us to celebrate in her honor - and being the ice cream queen that she is, we will have ice cream!!!! Nonetheless, its been an interesting week (for lack of better terms- wink wink) back at this office without her around, and I will scrub my mouth out with soap when I say "I cannot wait until she returns next week." As my daughter says to me "I know right- ha ha." The card is purple since that is HER color... I added some sparkles since what else for a girly birthday!!! 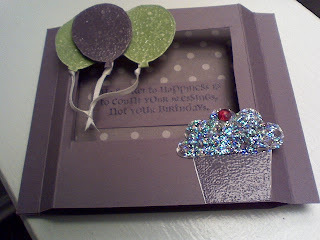 Here is what I did- and I have been going thru a phase of these cards... so expect to see more... they are called Window cards, and easy peasy!!! Its 2 pieces of CS, cut 4 1/4 x 5 1/2, and one piece of DSP cut 4 1/4 x 5 1/2. Score all three at 1 inche and then score at 1/2 inch on the short sides. Choose one pieces of CS as your 'window' and the cut an opening, circle, square, whatever you desire. Decorate accordingly. Use sticky strip red tape for adhering at the 1/2 inch score lines to put it all together. It folds flat and fits into a standard (A2) size envelope. Cool huh? Happy Birthday Boss, may you have safe travels home and do not worry, we will party without you!